The holidays are finally here. Unfortunately, that also means that classes are usually smaller because people are able to spend more time with family. We understand, but make a point of continuing your exercise. All the holiday treats have a special ability to stick to you. Even if your schedule is totally busy or you’re travelling, you can still make the time to exercise. All you need is a few minutes and the will to do it. Here are a few bodyweight only workouts that you can complete on your own over the holidays in the event that you cannot make it into the gym. Complete 20 burpees, run to other side of room, complete 19 burpees, run back, all the way until you finish with the 1 burpee. There are 4 workouts you can easily do without any equipment or even a warm-up. All you need to do is put on some clothes and do it. 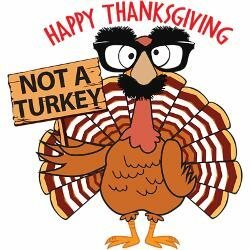 I hope everyone has a happy Thanksgiving and enjoys eating lots of food.